IMPORTANT: Please read the entire prospectus before completing your entry form. Yosemite Renaissance is a non-profit art organization founded in 1985 to encourage artists to create diverse interpretations of Yosemite National Park and the surrounding Sierra Nevada region. The organization seeks to inspire a new generation of people to understand, preserve and protect our wild lands and natural places. The Yosemite Renaissance Exhibition is an annual exhibit that offers an opportunity for artists inspired by nature and the American wilderness to display and promote their art. The exhibit opens at the historic Yosemite National Park Museum Gallery in the heart of Yosemite Valley, then travels to other art centers across California. For over 150 years, artists have played an important role in the establishment of our state and national parks, inspiring people to visit iconic natural sites, and to protect our natural resources. Subject matter must be related to the landscape, environment, wildlife and people of Yosemite National Park and the Sierra Nevada region. Both representational and non-representational submissions are allowed. We encourage artist who apply to celebrate the beauty and wonder of nature through art, but also to consider and explore environmental issues, ecology, biology, forestry, current events, political, spiritual and cultural themes. Contributing artists should be aware of the geographic range of the show. While the nexus of the exhibit is Yosemite, the scope of the show also includes Sequoia National Park, Sierra National Forest, Ansel Adams Wilderness, Mono Lake, Bodie, the White Mountains, and more. The high Sierra, east side and west side foothills and canyons from Lake Tahoe to Tehachapi are all included! The area is huge, consisting of hundreds of thousands of acres of rugged peaks, deep valleys, forests, chaparral, deserts, lakes and streams. If your work is inspired by these places, it will be considered. Mastery of traditional media, technical expertise, style and personal vision are important factors in the selection process. One of the goals of Yosemite Renaissance is to encourage innovation. Jurors will consider the use of new tools, technologies, materials and techniques. $5,000 in cash awards will be announced at the opening reception at the Yosemite National Park Museum Gallery. The exhibit is open to artists worldwide. All submissions must be completed in English. Participating artists must be able to communicate in English, either directly or through an interpreter. The exhibit is open to visual artists and artisans working in all media including but not limited to: oil & acrylic painting, watercolor, pastel, mixed media, printmaking, photography, digital art, drawing, fiber art, glass, woodworking, jewelry, ceramics, and sculpture. No film, video, interactive media or performance. Original works only. No reproductions. Submitted works must be created in the last 5 years. Each artist is limited to eight entries. No more than two entries from any artist will be accepted for inclusion in the exhibit. Entry is through SmarterEntry.com only. No other types of submission will be accepted. All works submitted must be available for sale. Yosemite Renaissance retains a 40% commission on sales. Once accepted for the exhibition, submitted works must be sold through Yosemite Renaissance, until the close of the exhibit. Artists must submit one digital file for each piece of artwork entered. Please review the Image Format guidelines on SmarterEntry.com when you submit. PLEASE NOTE: We do not need to see the mat or frame in the digital submission, unless you feel it is a critical component of the work. Including the frame in the submission takes up space, can distort or obscure the image, and makes it harder for us to use the image for marketing purposes. Digital files must be in a .jpg format. Each image must be less than 8 MB in size. We recommend dimensions of at least 1280 pixels on the long side. Do not submit images smaller than 800 pixels on the long side. There is a special feature on SmarterEntry.com for 3D submissions that allows multiple images to be "stitched together" in order to show multiple views of a piece. Please be aware that this shrinks the images in order to combine them. We may request higher resolution images if the work is selected for the exhibit. Please use your artwork TITLE as your filename. Do not use special characters. Letters, numbers, and spaces only. Please review the Image Format guidelines on SmarterEntry.com when you submit. These two documents must be submitted along with your images and other information. If your work is accepted, edited versions will be available for viewing by the public during the exhibit, and may be used for marketing purposes by Yosemite Renaissance to help promote the exhibit. 1. Preliminary and final selection for inclusion in the exhibit will be made by the jurors from the digital images submitted. Approximately 50 pieces will be selected for the exhibition. 2. If, upon delivery, submitted works differ significantly in appearance, size, or medium from the digital files, the work will not be included in the exhibit. 3. Independent judges are invited to select the award-winners from the original art. The award-winners will be announced on the night of the opening reception, Friday, February 22nd, 2019. A panel of artists, curators and art administrators will make the selection of works to be included in the exhibition. Award-winners will be selected by a panel of independent judges. Jurors and judges will be announced at the opening reception at the Yosemite Museum. We do not announce our jurors or judges in advance. Jury results will be announced via email in December, and will be posted on our website www.yosemiterenaissance.org when they are available. Artists who are selected for the exhibition will receive additional information via email after the initial notification of acceptance. We recommend that two-dimensional works not exceed framed dimensions of 30x40 inches. Larger works may be submitted, however works that exceed 30x40 inches may be rejected due to size constraints. Triptychs or other multi-image pieces (exhibited under one title) must be framed as a single unit. All 2D artwork accepted for exhibition must be framed and wired for hanging, with any additional hardware provided by the artist if required. No SAW TOOTH hangers. Metal prints and gallery wrap paintings may be displayed un-framed. If you are not sure if your piece qualifies, please inquire via email before you submit. We recommend that three-dimensional works not exceed 60 inches in height. Larger works may be submitted, however works that exceed 60 inches in height may be rejected due to size constraints. All works accepted for exhibition must be ready for presentation. Artist must disclose and provide any special display hardware or other fixtures required for display. The gallery has a variety of pedestals in assorted sizes available for 3D works. The Yosemite Museum Gallery, and our Traveling Exhibit venues, reserve the right to refuse to display any artwork due to space limitations, display problems, or museum / venue policies. All artwork must be packed in sturdy cardboard, reusable containers made for shipping artwork. No packing peanuts allowed. Bubble wrap and soft foam packing materials are OK. Packing materials must be designed to be easily removed AND replaced for return shipping. All hand-delivered work must be protected in the same manner, for safe transport between venues during the traveling exhibit. Exhibiting artists must ship their accepted artworks to the Yosemite National Park Museum Gallery at their own expense. A pre-paid return label must also be provided by the artist. The museum will schedule one day for receiving works delivered personally by the artist or by proxy. The receiving date will be announced in January, 2019. Works from the exhibition may be included in a traveling exhibit through November 2018. Please indicate on your application if you would like your work to be included in the traveling exhibit. 2019 venues include the Yosemite Museum - Yosemite National Park, Kings Art Center - Hanford, Carnegie Arts Center - Turlock, Gallery 5, Yosemite Gateway Gallery Row - Oakhurst. While it is unlikely, venues may change without notice. Due to space limitations, there is a possibility that some works will not be displayed at a particular venue during the traveling exhibit. Each venue will determine what they can display, at their own discretion. · Agreement by the artist to the terms and conditions in this prospectus. · Agreement by the artist that accepted entries will be available for display and available for sale. 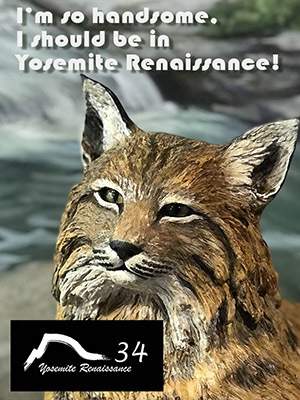 · Agreement by the artist that images of submitted works can be used by Yosemite Renaissance, partners, and assigns for publicity purposes, and can be reproduced in printed or electronic form for the promotion of the exhibit and the activities of Yosemite Renaissance. The utmost care will be taken in handling artwork while in Yosemite and other venues. However, no responsibility is assumed by Yosemite Renaissance, Inc., the National Park Service, the Mariposa County Board of Supervisors, exhibiting venues or any other sponsoring agency or assign for loss or damage from any cause. Artists wishing to insure their work are responsible for their own insurance.